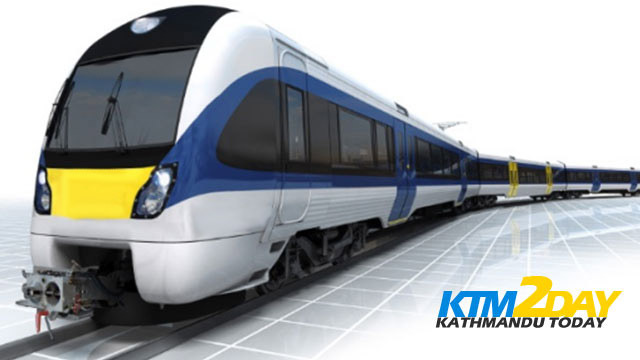 Construction of the Mechi-Mahakali Electric Railway formally began on Sunday, with Minister for Physical Planning and Transport Bimalendra Nidhi laying the foundation stone for the project’s 108-km Simara-Bardibas section. As per the agreement between the ministry and three contractors, bed track on a 5km stretch of the Simara-Bardibas section will be completed in the next two years. Nidhi said the railway would create more employment and ease public transportation, enabling people to travel longer distance in shorter period. The Mechi-Mahakali Electric Railway is 945km long. The cost for the constructing of the 5km stretch is Rs 280 million. Although the government’s estimated cost was Rs 600 million, the contractors offered to complete the work at Rs 280 million. Although the contract agreement was signed in December 2013, the construction was delayed due to the delay in determining compensation for land acquired for the project. Amid development projects facing land acquisition-related problems, Nidhi asked the public not to create such problems by demanding hefty compensation. “The government is ready to provide compensation as per the law,” he said. The government has planned to complete the project by dividing the railway into different sections. “We will shortly call a tender for two other sections of 65km and 28km lengths,” said Ananta Acharya, director general of the Railway Department. He said a detailed project report of both the sections has already been prepared, and the department was preparing to call a tender for the DPR of the remaining sections. The Ministry of Physical Infrastructure and Transport has demanded additional resources for the project in the budget for the next fiscal year. “We have demanded Rs 3 billion for the project,” said Tulasi Prasad Sitaula, secretary at the Physical Infrastructure Ministry.